This is a webpage written by high school teachers for those who teach world history and want to find online content as well as technology that you can use in the classroom. 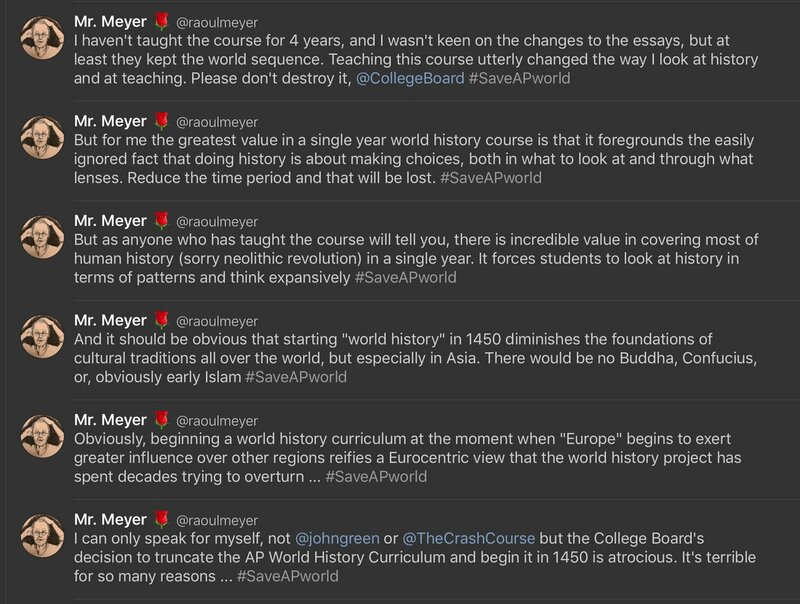 Changes to the AP World curriculum, the third major change in the last 3 years, has enraged many teachers and academic bigwigs. That's because the College Board recently announced that in the 2019-2020 school year, AP World History will begin in 1450 with exploration and the rise of the West. Since its inception in 2002, AP World started with prehistory. The announcement came shortly before the AP World Reading in Salt Lake City (where AP teachers score the AP test). Teachers questioned Trevor Packer, senior vice president of Advanced Placement and instruction at the College Board, at an evening open forum. The change, according to many teachers, would exclude the rich history of Afro-Eurasia before European contact. For example, students would not learn about the rise and spread of Islam, the golden age of the Tang and Song dynasty, the travels of Ibn Batutta and Marco Polo, or, "wait for it," the Mongols. Some teachers said the changes would force them to teach a white history instead of the right history. Trevor Packer responded that the changes were not intended to exclude that history. Students could study that history in a new pre-AP course being launched in the same year as the changes. The problem with that plan is that many school districts cannot afford to offer a new pre-AP course and only offer one year of world history. In the video below, AP teacher Tom Richey, annotates one teacher's response to Trevor Packer during the open forum. You'll hear him dismiss her complaints. 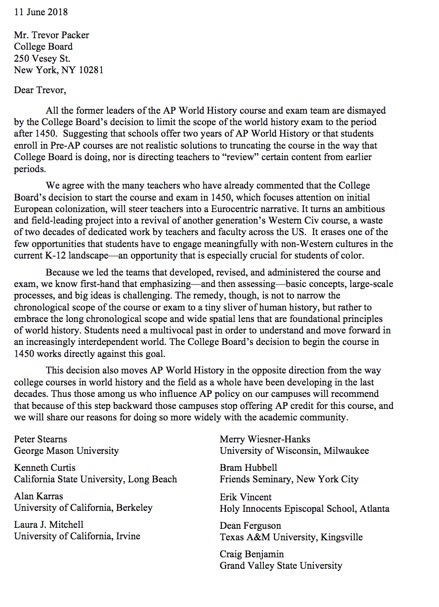 And in the letter below, academicians threaten to persuade schools not to give AP credit for an abbreviated world history course unless the College Board agrees to reconsider. Among the signers are Professor Peter Stearns, who wrote a textbook that many of us World History teachers use, and Professor Merry E. Wiesner-Hanks, who has written numerous books about world history, including "A Concise History of the World." Another bigwig, Ross Dunn, one of the founders of the World History Association, and the author of many books, including one about Ibn Batutta, sent a long eloquent letter to Trevor Packer protesting the proposed change. He argues that the College Board should retain the long scope of the course. I would much prefer that the APWH exam continue to embrace all six historical periods because young people today badly need a mental framework, if only a fragile one, for thinking about and situating themselves within the stream of time, including the very deep past. And here the world history podcast, On Top of the World, talks to historian, Rick Warner, a professor of Latin American history at Wabash College, about the proposed changes and the College Board's dismissive attitude. You can also read about the controversy at Politico. 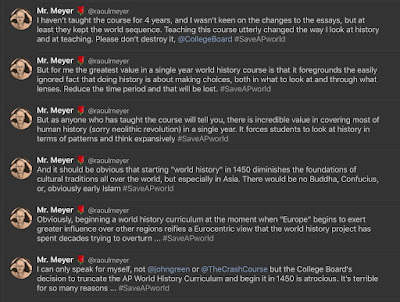 Here are tweets from Raoul Meyer, one of the script writers for John Green's Crash Course series. If you click on theimage, it should enlarge for easier reading. 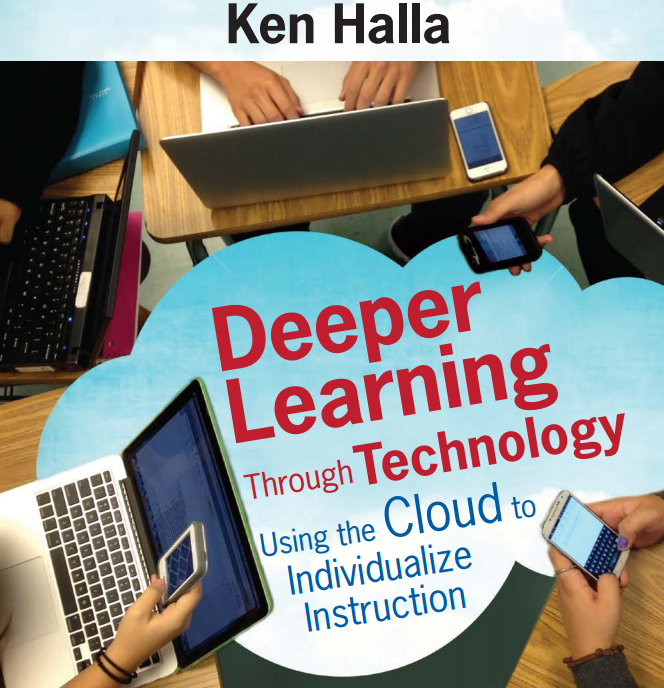 This site is maintained by: George Coe (ggcoe83@gmail.com) and started by Ken Halla.